We are one of the leading learning management system (LMS) providers in India with service experience of over 16 years. Our fully customizable, secure, fast and robust eLearning management system (LMS) has been installed in more than 14 onsite locations and numerous on Hosted Servers. These are Airtel, Avaya Global Connect, Xerox, IIT Delhi, ICI, Reliance Life Insurance, Reliance General Insurance, ICICI Bank, Bharti Infratel, Hindustan unilever etc. 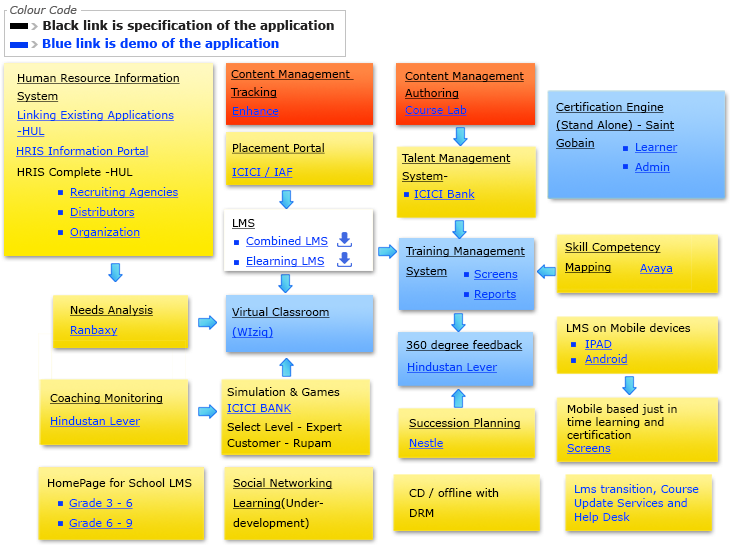 Also, there are modules on simulation working at ICICI Bank which is a LMS by itself. Our extensive experience as an LMS providers acts as a solid base for providing software learning solutions to train people and leave a long-lasting effects of learning for small, medium, large organization or a training company. Our elearning management systems (LMS) is also integrated with a strong certification or assessment engine to access the learning gaps of the learners with pre-setted guidelines. These test helps reinforcing the new information learnt and records the learner’s progress. Our secure elearning management system easily handles data exchange of over lakhs of learner with 99.5% of Uptime. Our LMS is a perfect blend of old style secure learning software with new style responsive design and has helped clients win many accolades and awards. 2. Reliance General Insurance Company Ltd.
Admin back-end for mapping learning needs across users, with filters like, function, location, designation, etc. Auto-mailers on nomination status, feedback requests, etc. Admin backend for maintenance of programs, participants, feedback questionnaire, etc. MIS on program participation, participant 360 o feedback, etc. Users Management – upload, debar, certifications’ assignment, etc. Content Management – upload of Question Banks, Release or un-publishing certifications, modifications/ additions to existing certifications’ Question Bank, etc. These rooms and number of participants can be changed depending on your needs. However there would be a financial implication. For each class you schedule for your teachers and students, we provide you separate class links for them. Send them their respective links and they are all set to go for their classes. Yes, no registration is required on WiZiQ for both teachers and students to log into an online class so teachers and students can join a class simply by clicking on the class link. Teachers can enter the class before its scheduled time to set up the class and get it ready. Needless to say, online platforms have made learning more interesting than ever before. You are good to go for an online class at a moment’s notice with just a single click, no downloads, no additional installations or plug-ins. Online classes go much easier with WiZiQ. Teacher can get into the class before its time, check audio video devices, and set the class ready and content in place. As the time arrives, the class is good to start. The collaborative web conferencing environment enables you to communicate synchronously using audio, video or text chat, interactive whiteboard and content sharing. Everything you need to write in the class is at your fingertips- Pen, Free hand, Text, geometrical shapes, symbols, graph, or images. Unlimited whiteboard tabs with rich features like copy, paste, undo, redo, drag and resize. Use digital pen or mouse pen whichever you feel comfortable writing with. Pre-built content can be uploaded in formats like Word, PDF, PowerPoint, Video, Audio, Flash, and Excel. Upload them in the class or use Content feature in your account to upload beforehand. All options in chat- private or public and enable or disable chat for all. Use them as you want. Hand over the microphone to one or more attendees. You may control microphone individually for all the attendees. The presenter can see his live video and video of one more attendee. All attendees can see the presenter and the attendee allowed to use webcam. Thousands of videos on YouTube are at your fingertips. Enter a link and immediately play a video and share it synchronously in the classroom. Google, Wikipedia or any information already on web now works for you. Browse and tour web-links you want to share with your attendees in the Virtual Classroom. All the way important! Have your name and logo in the Virtual Classroom for that extra edge. Separate toggle access to audio, video and writing features helps you manage the attendees. Writing allows attendee to write and upload, audio gives access to use microphone only, and video passes on right to use microphone and webcam both. For those who need to demonstrate some software or file opened up on their screens, they may use screen sharing. Install a screen capturing plug-in and then they can share their screen with the attendees. CourseLab brings to you power of creating web based training, software application simulations, computer based training, and interactive e-learning content. Some of the CourseLab features are listed below. Import PowerPoint® presentations into the learning material **. Objective-based scoring allows creating scaled tests. Handles data, like, HRIS, Performance Appraisal & Development Action Plan, Sales Performance, Training, etc.